The Svadhishthana Chakra is about relationship. 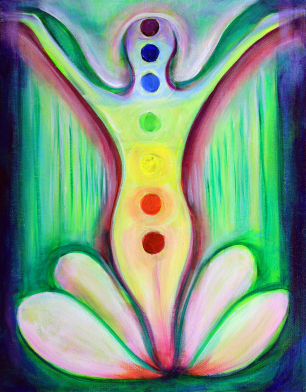 If our sacral chakra is balanced we can trust, feel free and allow ourselves to be deeply connected to others in our life. It is the seat of creativity, procreation and sexual energy. Its element is water which when allowed to flow freely, no forcing and no holding back, guides us down the river of our life. All of life is movement; relationships ebb and flow, children grow, our bodies change with each passing year as do the people, places and things around us. Connecting to the vital force of our Svadhishthana chakra allows us to flow moment to moment, open and receptive to our emotions allowing us to meet each passing day with creativity, confidence and truth. color of the Sacral Chakra. Chant the sound VAM and silently say: I trust as I open myself to others. Creative, sexual and emotional energy flows freely. I express my true nature with confidence. Colleen &her friend Madeline will not be able to make it on Mon. but they WILL be able to come on Thurs. – I’m not sure if they signed up for that class. I will be there Mon. but cannot make it on Thurs. I hope this is not too confusing. Everyone’s work schedules changed since class last Thurs.